Embossed Digipak packaging with a 20 page booklet. This is a crapy album..Nothing to do with their past releases,sadly..
One of the things i respect from Rome its the consistency. The band may always change style, inspiration, spiritual direction but always maintain loyal to their compositional quality. Never dissapoint with some aborted quasi album as many bands do, but truly bring a complete set of well composed tracks that gives true form to what we can call an album, never come with shallow thematics both musically or poetically, sincere till the bone. That is something we should applaud. And even if for any reason, one may not like the album because may not like the form or the content, you may never have the chance to say its crap, more likely you'll simply don't like. 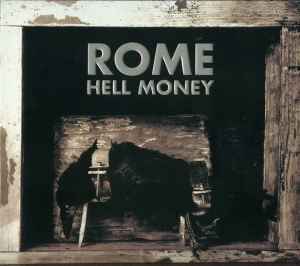 Rome used the resource of Pathos abundantly during their first three albums, they are fully rounded of grandiloquent sentiment and emotion, with each they got higher in the standards of Pathos till the point of a bombastic opus in "Masse mensch material". But since "Flowers from exile" they switched to Ethos. Their emotions are more personal and less exhalted, more humane and less ideal and probably this distinctive change lost many followers accustumed to the ever present idealization granted to everything, from politics to TV shows (and most modern music in between). Fact is a Pathos driven music always reach easier to the listener, simply because it touches him with strong sentiments and its highly emotional. While ethos appeals more to reason and perhaps the subject of power that may lie in poetry. Thats the playground from Rome. They inverted the values. Their last three albums culminating in "Hell money" shows the band going further and further into the exploration of pure poetry accompanied by music and not viceversa as in their first three set of albums. And we have here no less than a ripped heart of album. Consequentially poetic till the core and obviously painful, perhaps touching grounds that Swans has transited before regarding the topic of love in form, even though they maintain the simplicity that has characterized them recently. They added some brutal effects in the form of samplers or synth lines from time to time to enhance the power of the poetry and the emotion that can be derived such as in: "Tightrope Walker (Wild milk" and "Red-bait". So they continue to be at the top, unafraid to express what they have to and to sing along the misfortunes of been human.